ASP A52261 Agent Concealable Baton, Steel, 40cm FREE SHIPPING! The Agent Baton incorporates a 4140 steel striking surface. The 4140 Steel middle shaft and handle are forged to shape and then precision machined. The grip is fine line, Crosstec knurled with spiral micro grooves. Rings accept the included Nexus baton clip. Agent Batons expand to 30, 40 or 50 cm. They have the form, fit and striking potential of a duty baton. The reduced diameter and low profile grip of the Agent may be concealed inside the waistband or worn on the belt. The Nexus clip may be adjusted to a variety of positions along the handle to enhance concealment or ease of presentation. 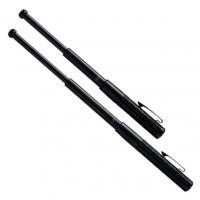 Agent Batons can be carried tip up or tip down. As with all ASP Disc Loc batons, the Agent is retracted with a simple push of the cap. ©2002-2019 CopsPlus.com: ASP A52261 Agent Concealable Baton, Steel, 40cm FREE SHIPPING!